My family and I were at a hunt club over the weekend, fishing. I dont want to disclose the name for fear of them getting mad. We stayed at a house on the property in a town called Annada, which is approx 15 mins away from the clubhouse. The house sits in the middle of farmland/hunting ground and stands alone. This is the duck house and is primarily used for duck hunters. On Saturday night I was standing out on the deck looking East at the sky. Right above the tree line (about a mile away) there was a very large UFO hovering. It stayed in one spot for a good 10 mins. 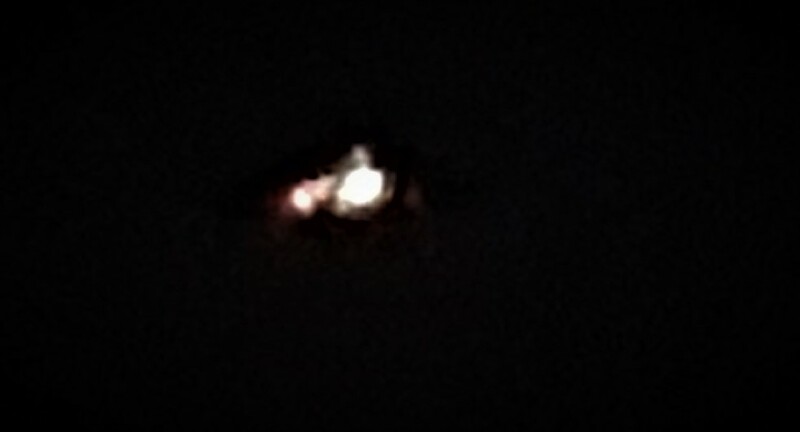 I went in and grabbed the binoculars and sure enough, it WAS a beautiful perfectly round Craft with several lights in a perfect row all the way around! Without the binoculars the lights looked orangish/yellowish, with the binoculars the lights were perfectly round bright white lights! I called my son and nephew out and they also saw it! I took pictures but they look nothing like what I saw which is a huge disappointment! In fact, Im sure I took way more pictures than whats actually on my phone, only 1 is showing up then goes to my son and nephew of them sleeping, then there are a few more?? They were awake when I took all the pictures, and now they are out of order? I tried getting a picture through the binoculars and that definitely didn’t work, lol. It was really cold this past Saturday so we kept going to the window to check if it had moved. It did move slightly up and down after about 15 mins, after about 20 mins from first spotting it, it was gone! So we didn’t get to see it fly in any direction. I took pictures in the daylight to show how far the trees were from us and circled the location of the craft. I will also upload a picture I found on the internet, it’s the closest to what I saw through the binoculars on the lights were bright white and I could only see what I circled. There was no sound from the craft.